Does your establishment have drive-thru service? Then you probably know that over 50% of your business is dependent on your wireless drive-thru system. Whether you’re just getting started in a new location, or your system is in need of an upgrade, we’d like to share a few tips on what to look for in a quality drive-thru system. It’s obvious that your wireless drive-thru system needs to offer clear, crisp sound — to employees and patrons, alike. What’s less obvious is knowing whether a particular system possesses the ability to deliver the great sound quality you’re looking for. To ensure quality sound, your drive-through system should include the following qualities: – Digital noise reduction – Automatic echo cancellation – Industry tested headset durability – Automatic gain control for steady volume – Spread spectrum for reduced interference – The latest in digital sound & network connectivity – Year-round design (especially important during a Des Moineswinter) Our 3M Drive-thru G5 headset is an excellent example of a drive-thru system that has all of these features. At the end of the day, your system is only as good as the team installing it. That’s why our drive-thru systems designers and technicians are factory-trained and certified in 3M, Panasonic and Fast Track systems. Whether it’s maintenance, or a new system install, you can depend on our team to exceed your expectations — guaranteed. 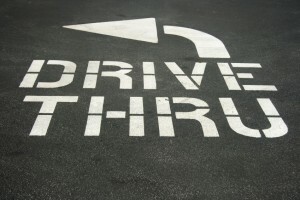 We hope this article helps clarify what to look for in a drive-thru system. If you have any questions, please contact Pridham Electronics anytime. We’re always happy to help! Music is FREE, right? WRONG! “Fight” Songs that Pump Up the Badgers & Their Fans!